One OO layout I have been planning is one based on a fictional line running fro Cranleigh across to Haslemere, via Dunsfold. As there was a proposal, before the line was closed, to electrify the line from Cranleigh up to Guildford, I thought it just as likely that the line to Dunsfold would also be done. I am setting layout in period 1969-71 when the 2Bils and 2Hals were just still running, and were in blue. Dunsfold was home to the development of the Harrier jump-jet, so I reckoned there would also be a lot of other businesses based there. I used to live just down the road so know the area pretty well. The proposed model is basic, just 3 lines, one of which is goods siding into industrial area around airfield. I wanted somewhere for my working level crossing, and a Hornby Dublo plastic art deco station building. 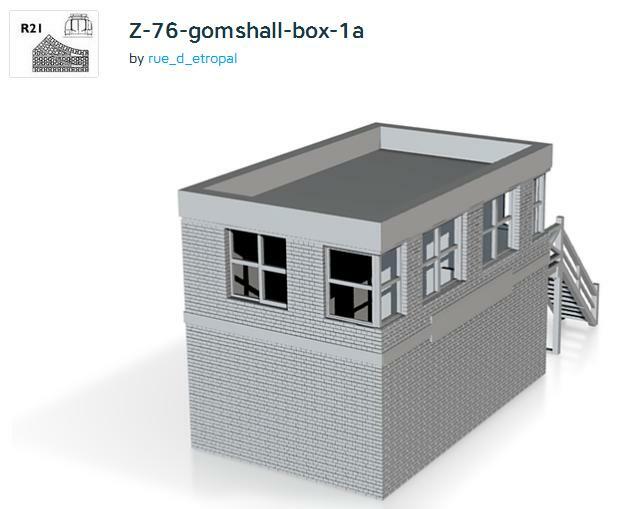 I was wondering about a signal box, and thinking the line could have been upgraded during WW2, found a SR WW2 signal box on the Guildford to Redhill line at Gomshall, and designed something similar for 4D printing. The WW2 signal boxes were usually brick construction(but also heavily reinforced) and would make a change from the art deco buildings of that time. Fortunately because of their bomb proof design, the example at Gomshall survived, and is still in place(unused) now. The Gomshall building is on the platform, but looks tall enough to be on ground level. It is not a pretty building, but is a design that fits nicely between the SR art deco of the 30s and the BR designs from the 50s. I had considered using one of the Triang Hornby signal boxes, but I thought it looked too modern. For the layout I am building it on 3 solid cork boards bought from my local ASDA. With the level crossing in middle, the layout will split and then fit in a suitcase, so easily can be transported. Operationlly ot won't be complex, with at least on EMU on an auto shuttle. The airfield connecting line will have something moving, but had also considered some preserved stock items. David Shephard only lives just up the road, and had there been a line through Dunsfold it might have made a god base after Longmoor shut. Just gives me something else to put on line. Also thinking that my Heljan Metropolitan loco could be run , as one was converted to 3 rail, so I propose another one was preserved and similarly converted. One item that is giving me problems is finding a suitable figure for a Stig character. Top Gear TV program has been filmed at Dunsfold for a few years. Even a standing up type motor cyclist is difficult to find. Then again trying to fin=d stuff is part of the fun in this hobby. signal box arrived. Now I have to find a way toglaze it and add interior. Not forgetting to paint it. dels at moment as doing major changes to what is now workshop/spare bedtroom/library. Hopefully will have cleared up mess by end of weekend. Also now have Stig figure , thanks to being directed to a pen with a 'floating' Stig figure in barrel. Will now need to find a police box/Tardis to justift time travel of Stig! That's why this hobby is so much fun. Still messing with layout design. May add some points, with level crossing on second board. This gives more room for station platdforms, and might not need fifddle yard at that end. I now have a diecast model of Harrier Jump Jet , right model(GR1) but says it is 1975 period, so might stretch period of layout. Hopefully it will sit on end of a thin stick above layout, the advantage of such an airplane as it can be stationary in the air(having seen one near Dunsfold stop and stay still when I was working and living in the area). Trying out various ex Hornby Dublo plastic station and platform bits, and think I now have a plan. More complex in some ways than originally intended. Moving layout to my art workshop, so I can do more work on it than I was able to at clubrooms. No rush, as I don't plan to get this exhibited till late next year, as am currently concentrating on various boxfile mini layouts. I now have a diecast model of Harrier Jump Jet , right model(GR1) but says it is 1975 period, so might stretch period of layout. The RAF began operating the GR1 in 1969/70 and the airframes were upgraded to GR3 spec around 1975-6. And I think* that the colour scheme for the GR1 was pretty standard for those 5 years, so you should be okay for timeline. I thought as much. Before I bought the model, I did a google on that particular plane and found photos from early 70s which looked similar. I have the old Frog kit as well, which probably has early 70s markings, so I can compare. Slightly amuses me, that this kit then got sold(by Hornby?) to the Russian(USSR) company Novo, so probably was popular with their military people. We only moved back to just up the road in 71-72, so I just missed the last 2Bils and 2Hals running, although do remember seeing one pass my train near Basingstoke in the 80s, in departmental service. This is one reason I am sticking to that true blue period. Now if someone was to bring out Hastings stock r2r, as well as a Tadpole, then I would be well suited, as I used those on the Redhill line. Back in early 60s we lived near to Ascot line, but all I remember is that the trains were green. By the time I was driving round the Dunsfold area, they were testing the Navy version and the ski jump. Although everyone knew the airdrome was there, it was not very visible, and I only realised exactlywhere is was and how big it was when I looked online a couple of years ago. Knowing the landscape round there, I think I can justify position and route of my fictional line. I bought some of the new Dapol signals at the weekend, now I hae to adapt what I am planning slightly, as I originally wanted a flat top baseboad, no frame, but need 2 inch clearence under base. Luckily I have enough height which can be reduced, so it will still fit in suitcase. Weight shoukd not be an issue. Having now decided I am definitely fitting the Dapol signals working, I want some way of activating them automatically when I use my auto shuttle . I think that a single reed switch near to end of platform, and a magnet on end of rear coach bogie will give the signal a small kick, so as train sets off the signal changes back to danger. The train moves onto the fiddle yard, is stopped by the diode, and then reverses. When it crosses the reedswitch, it iwill switch the signal back to clear. I will add an override switch which can reset signal if necessary. I have not used reed switces before, and wonder are they strong enough to take the sudden kick of power to activate the signal. Aso when the Dapol signals were first produced some were having problems with burnt out motors. I have had a good look at maps and can see no reason why a double track line could not have been built from London end of Haslemere , across to Dunsfold, then up towards Bramley to Cranleigh line, crossing over and continuing onto Guildford Redhill line just to Redhill side of Chilworth station. I am presuming line was planned as double, but only built as single track. During WW2 the line is doubled, resulting in rebuilding of Dunsfold. In fact old station I assume is damaged durung war, so new station buildings built after te war9late 40s or 50s). There is also a junction with line curving round to Cranleigh(This was my originak plan, till I came up with idea of adding other line). Now in the 1960s it was actually planned to electrify the line down to Cranleigh. I am assuming this is done, and the other line is also electrified, along with the line from Guildford to Redhill. Now I have two potential routes, so the double(? )line out of Dunsfold is run as two single lines. One is for trains to Redhill,and the other is service to Guildford and Ascot via Cranleigh. The line to Horsham is unused, possibly closed. The line from Dunsfold to Haslemere is in process of being electrified and service is provided by a Thumper unit. This will result in 3 auto shuttle trains running, one in one direction and one each on each of the lines the other way. It is also hoped to have some freight moving along sidings. As I am assuming the Redhill to Tonbridge line has not been electrified, the Tadpoles are still used on that route, and if anyone produces one r2r, I will probably get one. The Horsham service could use one. Also if Hastings width stock is done then class 33 headed stock coulfd be run sometimes. One reason for theline being built is the bottleneck at Guildford, as it only has a 2 track line to south, and several lines radiating out of London end. My route would aleviate some of that, and would be a good reason for line being doubled during WW2. This all sounds rather normal, but plans are to add some unusual bits, assuming I can get hold of them. Some I have got, but I still need to source a couple of items.